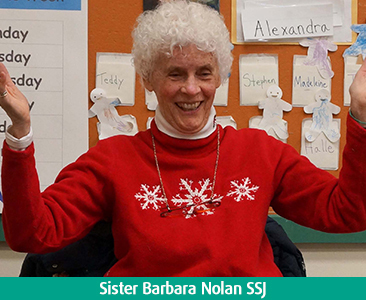 Sister Barbara Nolan SSJ always knew she wanted to be a teacher. In 1956 she entered the Sisters of Saint Joseph in Chestnut Hill, Philadelphia. After teaching elementary school for several years and serving as Principal at Saint Columba School in Philadelphia, Sister Barbara was assigned to Chestnut Hill College as teacher and chair of the Political Science Department. After teaching for 59 years, Sister Barbara retired from Chestnut Hill College in May of 2016. She knew it was time to move on to something new. She wanted to stay in education in some way, work with young children and in a school that was connected to the Sisters of Saint Joseph historically. What happened next was a surprise and a joy! Click here to read more about Sister Barbara. that this is what you wished to do after your retirement from CHC. You are a very special person, and were an amazing professor of political science. So glad to have found you! !